During my first term as a new lecturer in twentieth/twenty-first century women’s writing and gender studies, a male colleague said that he would never teach H.D. in a course with Pound and Eliot because she “just wasn’t in the same league, at all.” When I disagreed, a second male colleague offered to sit down with me “and go line by line and prove why her poetry was not as good as that of her male counterparts.” The cocktail-party conversation has since turned into a battle over the curriculum. I have been told by men in meetings that I can teach women writers as long as I don’t teach “ideologically,” that the study of English literature is a “pure field” and should be taught without “identity politics,” and that to insist otherwise is “nothing short of totalitarianism.” Such experiences continually affirm what Jane Marcus told me when I began graduate study: that in order to be a feminist and radical scholar, I had to evaluate texts not on the aesthetic, disciplinary and political terms defined by patriarchy to exclude women from public space, but by looking at how women writers disrupt and defy those very orthodoxies. Better yet, she said, go to the archives and find those texts; teach them not just as a corrective or counter-canon, but as exemplary—as the very subject itself. In this essay, I argue that the persistence of Cold War New Critical orthodoxies—made to seem intrinsic, apolitical and ahistorical—continues to effectively devalue women’s writing more generally, and especially the radical, gender- and genre-transgressing modernist women’s writing that defined the first half of the twentieth century. Despite consistent and successful efforts to recover a more complete canon of women writers, writing by women still remains on the edge of loss, its place in the canon precarious, always already in need of recovery. As both Cherene Sherrard-Johnson and Ewa Ziarek demonstrate in essays on Rose McClendon and Nella Larsen, “racial and gender segregations in our . . . [critical] aesthetic traditions” persist, despite a more inclusive modernist canon. That we have not always had access to women’s texts and narratives in the first place—including works by Lola Ridge, Paulette Nardal, Julia de Burgos, Laura Riding, Sylvia Townsend Warner and Mina Loy—is a testament to their radical nature as well as to the fact that they were made by women—for it is really only women who are held accountable when breaking with tradition, even while that tradition is being invented. In 1940, the American poet and theorist Muriel Rukeyser wrote, “so many times, when our scholars have talked of tradition, they have been thinking, ‘Repeat! Repeat!’ mourning some Golden Age to whose special knowledge they were admitted. But tradition is not repetition, that is blasphemy against tradition.” This reading of history, and the literary and political projects that Rukeyser would pursue in the same effort, would position her as an exemplary target for the gender and aesthetic ideology-making of the Cold War period. By looking at Rukeyser’s work and reception in the postwar years we can better understand not only how ideologies of exclusion were constructed through literary, academic and political values, but also foster the kinds of complex feminist approaches necessary for dismantling them. Photograph of Muriel Rukeyser, undated, c. mid-1940s. Photographer unidentified. Library of Congress Archives. Strikingly, the words used to devalue and confine women writers today —“ideological,” “aesthetic,” “purity,” “totalitarian,” “bad” —are the same words used half a century ago to do the very same thing. These words echo the rhetoric of Cold War institutions funded (sometimes secretly) by the CIA through the Congress of Cultural Freedom (CCF), as well as by the British Council and the Information Research Office (IRD) in England, and used to justify the making of a new literary landscape, effectively constraining the scope of prewar modernist literature to conform to the political and aesthetic agenda of a Cold War modernist canon. Following the second World War, the US government funded the production of literary journals and academic monographs, Area Studies was formed, and canons, prizes, and exhibitions were instituted, all to promote one version of Anglo-American cultural hegemony, and to counter the perceived threat of communism. As Greg Barnhisel notes in Cold War Modernists, modernism, once constituted by “wildly disparate” artistic movements and politics, was newly “presented as a pro-Western, pro-‘freedom,’ and pro-bourgeois movement” (2). The spectre of communism, conflated with the avant-garde and experimental projects of the previous decades, raised concomitant fears of feminism, homosexuality, sexual freedom and single motherhood, unaligned radicalism, pacifism, anti-war and civil rights activism, and anti-colonialism. As Alan Filreis demonstrates in his brilliant book Counter-Revolution of the Word, radical modernism—the impulse to join both aesthetic experimentation and left-aligned radicalism—was effectively dissolved in the postwar years as “many heretical writers were ‘being rejected automatically by publishers and editors, not because of a deficiency of literary quality, but because they [had] dared being critical of prevailing political and cultural reaction’” (98). Through archival records, Filreis provides an intricate map of how writers once popular and central to literary movements in the 1920s and 1930s (e.g. Genevieve Taggard, Winifred Holtby, and Horace Gregory and Mayra Zaturneska, as well as their protégé Muriel Rukeyser) were systematically isolated and excluded from postwar publishing opportunities and left out of the literary canon-making that occurred at mid-century. Most importantly, Filreis shows how the political and aesthetic aims of the Cold War were bound together: “Modernism,” he quotes Gilbert Malcolm Fess writing, “‘has lasted much too long’ and behaved ‘like a totalitarian dictator gone to seed’”; and he is able to demonstrate how formal experimentation was “dubbed . . . ‘bad poetry’” in order to enact a “restoration of language” and suppress the avant-garde, even “the idea of the avant-garde” (Counter-Revolution, 166; xi). How does gender complicate this Cold War reshaping of the literary landscape and of a radical avant-garde? Where, for example, do Mina Loy’s feminist, often revolutionary experiments in form, gender and anti-capitalist critique fit into this narrative of mid-century erasure? Thinking about gender in this period means we might have to revise how we define and constitute radical politics and its relationship to “revolutions” in artistic forms, because many women writers were unaligned or unaffiliated radicals, making them, as Rukeyser wrote, “vulnerable to both sides.” Might modernist women writers’ interrogation of gender norms as a personal, political and aesthetic mode have lead to the same kind of marginalization met by those affiliated with 1930s communism? What happened to women writers whose work was too avant-garde and radical for the depoliticized, hyper-masculine, impersonal canon being refashioned by the Cold War New Critics, and what are the implications of their recuperation now? The politics and affiliations of Hope Mirrlees, Nancy Cunard, or Sylvia Townsend Warner (whose communist, allegorical, genre and gender-bending novels have left her “in and out of the canon,” as Jan Montefiore has noted) are not necessarily legible in context of the narrative of left-wing political party activity and erasure that is being traced today. To put this somewhat differently, what happened (and continues to happen) to modernist women writers whose work transgressed and challenged the formal and political modes of both left and right? Despite the recovery efforts of feminist critics in the last decades of the twentieth century, we still have an uneven development, a modernist canon that forgets and that still allows for the kinds of aesthetic judgments of artistic inferiority and political judgments of “un-seriousness” that many women writers experienced in the period. This is in part because the same moment which saw the “general pattern of midcentury efforts to forget or conspire to repress both radical left poets of the 1930s and Revolutions of the Word from the 1920s” also saw women’s newly won roles in the public sphere under attack as part of Cold War political and aesthetic programs intent on reshaping women’s bodies and voices (Filreis, Counter-Revolution, 105). What happens to women writers who invented new modes that not only can’t be defined by twentieth-century binaries and boundaries, but that actively defied them? Writing for the Atlantic Monthly in 1947, the conservative American poet and theorist Peter Viereck announced the New Critical era: “[T]he spirit of revolt is over, the revolt against poetic forms and disciplines.” This supposedly obsolete spirit of revolt against literary and political orthodoxies had been essential for women writers who were perhaps its most productive and inventive avatars. Ziarek’s Feminist Aesthetics and the Politics of Modernism notes that suffragists redefined the struggle for the “right to vote as the right to revolt,” and our understanding of the period of modernism as a radical and experimental site for political and linguistic upheaval only becomes truly legible when we read women’s writing of the period; as feminist recovery has shown us, there is no modernism without Woolf, H.D., Larsen or Barnes. However, by the late 1940s, many women writers once considered key figures in 1920s and 1930s artistic movements (writers as different as Mina Loy, Josephine Herbst and Zora Neale Hurston, amongst many others) saw their work fall out of print or struggled to get new work published. Their exclusion from the literary marketplace and cultural institutions, often carried out under the nominal charge of “aesthetic failure” or political naiveté, in actuality reflected animus for being leftists, feminists, lesbians, single mothers and dissidents. This might provide an important perspective on Anne Fernald’s discussion of biography in this cluster, as it shows how the biographical aspects of women’s lives were leveraged against their own careers. Women writers were at times accused of transgressing the boundaries between politics and aesthetics, gender and genre—transgressions emblematic of radical modernisms, but which ran contrary to mid-century notions of women’s writing. Rukeyser supplies a powerful case study of this process. For a time the darling of the 1930s literary left, Rukeyser found her work by the end of the decade increasingly dissonant with the gender, genre and political publishing practices of the period. Her recently recovered, unpublished Spanish Civil War novel Savage Coast (2013)—a generically hybrid modernist war narrative full of avant-garde experimentation with sound, documentary pastiche, intertextuality, un-aligned radical politics and female sexual agency—was rejected by her publisher in 1937 because the anonymous reader report pronounced it “BAD” and “one of the worst stretches of narrative,” and she was encouraged by her editor, Pascale Covici, to focus on her poems instead. I have suggested elsewhere that both the form and content of the novel transgressed the gender/genre norms of the late 1930s/early 1940s—those promoted by both left-wing literary communities, which saw her work as too avant-garde, and the burgeoning New Critical establishment, which viewed her work as aesthetically weak. Like other radical avant-garde women writers whose work was generically hybrid, investigative, theoretical and often interdisciplinary, Rukeyser’s work transgressed aesthetic codes across the political spectrum, and especially the new gender codes of women’s writing that were adopted by both left and right. These codes found an authoritative voice in Louise Bogan, the American poet who served as poetry editor for the New Yorker from 1931 to 1969. During her tenure at the magazine, Bogan proved to be a particularly influential figure in the deployment of a virulent form of explicitly gendered New Criticism. In 1951, she wrote, “[f]rom the beginning of the record, female lyricism has concerned itself with minute particulars . . . [it is] a flawless distillation, a pure crystallization of thought, circumstance and emotion.” In this same review, she praises Adrienne Rich’s first book of poems for being “neatly and modestly dressed,” as W. H. Auden described them in his forward to the book, attacks Rukeyser for putting on “sybil’s robes, nowadays truly threadbare,” and writes that the latter’s work is “filled with gloomy humanitarianism” and “deflated Whitmanain rhetoric” (“Verse,” 151). Ironically, of course, Rich would soon revolt from her position as modest daughter of postwar lyric poetry, remaking herself as one of the most radical poets of the new women’s movement in the mold of Rukeyser, whose work Rich would champion and keep alive for decades. Bogan’s insidious aesthetic assertions erase a generation of women modernists. To claim that women’s writing no longer needed to respond to the material and political conditions of the times (“popular” expression) is to rewrite literary history by inscribing the gender and aesthetic values by which writing would be judged “good.” That Bogan felt that “the present period is not one of violent transition” in 1951—during the height of McCarthyism and massive surveillance programs, in a period of nuclear hysteria that saw the beginning of the Korean War, colonial revolt in Africa, independence in India, and growing civil rights movements at home—indicates how effectively radical dissidence as formal experimentation had been muffled in the preceding decade. Bogan returned to Rukeyser again and again, and it is clear why. 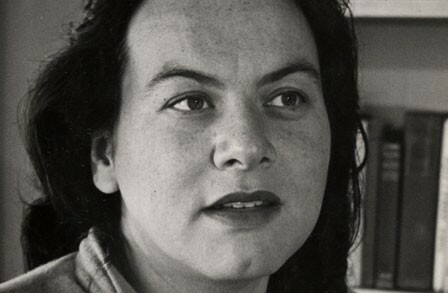 At every juncture where Bogan declared that there is “no real need for a further restless forward movement” Muriel Rukeyser would continue to push the spirit of revolt forward, writing theoretical and poetic explorations that crossed disciplinary and genre boundaries. At twenty-seven, Rukeyser began to work on and deliver a series of speeches, The Usable Truth, that would later become her germinal text on the political necessity of poetry in times of crisis, The Life of Poetry (1949). As in much of her writing during this period, Rukeyser worked in experimental, collaborative and interdisciplinary forms that challenged the “false barriers” of the prevailing cultural and political ethos—she collaborated with artists like Berenice Abbott on photo/text collections, and worked on writing the histories of those who pursued connectivity, invention and revelation, like the mathematician Willard Gibbs and the sculptor Käthe Kollwitz (The Life of Poetry, 20). Like her subjects and collaborators, the speeches and text that would make up The Life of Poetry moved towards a philosophical and political position that could be inscribed neither by any one activist or intellectual movement, nor any one aesthetic or formal movement, but that drew from their traditions. Wide-ranging and interdisciplinary, the text is a meditation on poetics, politics, art, philosophy, music, science, war, peace, protest, the environment, and literary lineages, among other subjects. It is a work very much in conversation with its historical moment—it begins on a boat, as she is being evacuated from the civil war in Spain, and moves through the 1940s, where she indicts the “New (Old) Critics”—but its antecedents and legacies are far-reaching. Like a blueprint to her oeuvre, The Life of Poetry engages polyphonic disciplinary and formal spaces. We might read these speeches not only as an indictment of the policies that Rukeyser was challenging in the spirit of revolt, but also as a response to her own experience of cultural and literary marginalization. Like Bogan in the New Yorker, Delmore Schwartz, writing anonymously as editor in the Partisan Review, penned a long, sexist critique of Rukeyser entitled “The Grandeur and Misery of a Poster Girl” in 1943. He asserted, among other highlights, that “she flew an airplane like an Auden character, and said Yes like Molly Bloom, to the working class”—an insidious transformation of a woman who authors into a woman who is authored by men. The Partisan Review editorial’s gendered language was emblematic of the period in which women who asserted authority were consistently put in their place, and it appeared in an issue that might well itself have been the poster child for the New Critical establishment, with two poems from Auden and essays by both Bogan and Lionel Trilling (his on E. M. Forster). On Rukeyser’s The Usable Truth lectures, delivered to “Vassar Girls,” Schwartz wrote, “here she was revealed in a new role: that of a big-league representative of the ‘creative spirit,’ speaking her piece with all the unctuousness and culture-schmerz of a junior theologian of poetics” (“Grandeur,” 471). How dare Rukeyser assert such authority, he seems to imply, that she would break with diminutive gender codes of “women’s writing” and theorize how a pervasive power-culture built on violent hierarchies had “cut off imagination” and enfeebled poetic possibility, had created a tradition of exclusion? 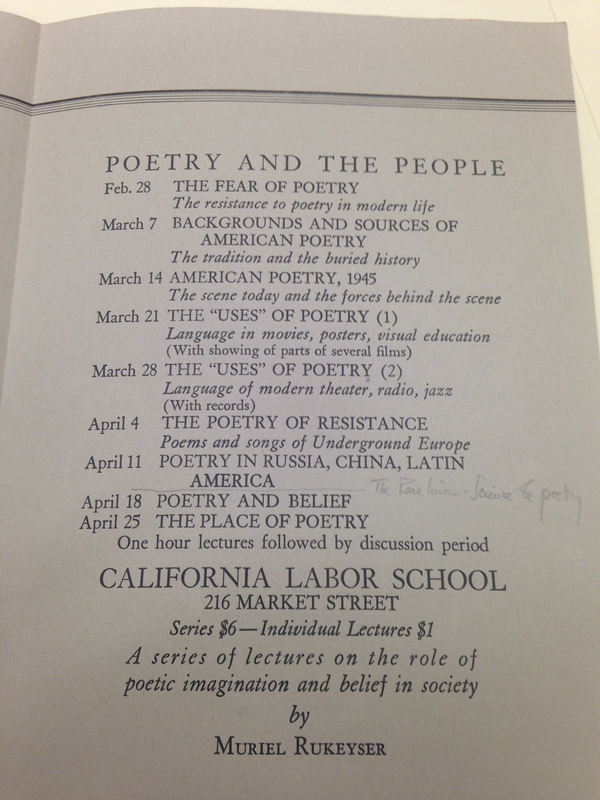 Flyer for “Poetry and the People” Lecture Series. Muriel Rukeyser Papers, Box II, Folder 18, Library of Congress Archives. Despite her critics, Rukeyser continued to deliver these speeches throughout the 1940s—at Vassar, Columbia and the California Labor School—and published edited and altered versions in magazines such as Poetry. She first tried to collect the speeches as a book in 1941, sending a manuscript to Oxford University Press, but, as Keenaghan uncovered, “no press would touch the book. An editor at Simon and Schuster noted that the lectures seem ‘to date in a way that might make them seem too much of the moment if they are incorporated in a book’” (“Life of Politics”). In the speeches, but not in the final version of the book, she writes, “If we can imagine the poems for this time . . . we can imagine the peace for the time to come. The form and content of peace!” (Rukeyser, “Draft of Part 1 and 2”). Written in the spirit of revolt that had defined so much of modernist women's writing, Rukeyser’s work offers a radical understanding about how form and content interact in systems of power, predicated on a theorization of connectivity, mutability and openness that is foundational for feminist theory and criticism. “[O]ur methods must not be fixed,” Madelyn Detloff writes in her essay here, “but adaptive.” To invent the forms that respond to urgent political conditions is to find new modes of liberation, new narratives and histories to think through. It is vital that we keep insisting, like Rukeyser, that narratives are not closed, that there is no static or monovocal understanding of a period or tradition, that the work of recovery is not over: “tradition is not repetition.” In order to keep women writers visible and central to the study of modernism, we must insist that the making and breaking of tradition is itself our field of study. Jane Marcus writes this most explicitly in “Changing the Subject,” her introduction to Art and Anger: Reading Like a Woman (Columbus: Ohio State University Press, 1988). The feminist recovery effort and reevaluation of the sexual/textual politics of the postwar period has been a defining element of the feminist theory that we work with today. From Audre Lorde, Kate Millet, Lillian Robinson, Elaine Showalter, Toril Moi, and many others, there has been ample attention paid to how the erasure and silencing of women happens on both a textual level and on a disciplinary one. But I’m interested in why these interventions haven’t managed to change the subject in a more far-reaching way. Muriel Rukeyser, “Holograph Draft of Parts 1 and 2 of The Life of Poetry,” Box 1, Folder 43, Muriel Rukeyser Papers 1844–1986, Library of Congress Archives. More information on modernism and the Cold War can be found in Greg Barnhisel, Cold War Modernists: Art, Literature, and American Cultural Diplomacy (New York: Columbia University Press, 2015), Alan Filreis, Counter-Revolution of the Word: The Conservative Attack on Modern Poetry, 1945–1960 (Chapel Hill, NC: University of North Carolina Press, 2008), Frances Stonor Saunders, The Cultural Cold War: The CIA and the World of Arts and Letters (New York: New Press, 2001), Andrew Rubin, Archives of Authority: Empire, Culture and the Cold War (Princeton, NJ: Princeton University Press, 2012), and Adam Piette, The Literary Cold War: 1945 to Vietnam (Edinburgh: Edinburgh University Press, 2009). Samuel Sillen as qtd. in Filreis. From a global perspective, Andrew Rubin’s Archives of Authority discloses all the ways in which the US Government, through the CCF in particular, and supported by the CIA’s international anti-communist projects on the one hand and FBI surveillance of dissidents at home on the other, “refashioned the global literary landscape, altered the relationships between writers and their publics, and rendered those whom it supported more recognizable figures than others.” Rubin’s archival work also begins to reveal “which writers were selected for marginalization, how they were chosen and why” (12). Muriel Rukeyser to Louis Untermeyer, June 25, 1940, Box 7, Folder 142, Louis Untermeyer Papers 1902–1972, University of Delaware Special Collections. Jan Montefiore, “Sylvia Townsend Warner: In and Out of the Canon,” Postgraduate Research Seminar, Queen Mary University of London, March 29, 2012. There have been some excellent restorative histories of left-feminist women writers in the interwar and postwar years: Paula Rabinowitz’s Labor and Desire: Women’s Revolutionary Fiction in Depression America (Chapel Hill: University of North Carolina Press, 1991) focuses on the 1930s, and Kathlene McDonald’s Feminism, the Left and Postwar Literary Culture (Jackson: University of Mississippi Press, 2012) explores antifascism and feminism in the postwar years. Ruth Jennison’s The Zukofsky Era: Modernity, Margins, and the Avant-Garde (Baltimore, MD: Johns Hopkins University Press, 2012) provides a radical reading and recovery of Lorine Niedecker. Peter Viereck, “Poets versus Readers,” Atlantic 180, no. 1 (1947): 109–12, 109. Ewa Ziarek. Feminist Aesthetics and the Politics of Modernism (New York: Columbia University Press, 2012), 21. Muriel Rukeyser, “Reader Report” to Savage Coast, Box 1, Folder 23, Muriel Rukeyser Papers1844–1986, Library of Congress Archives, Washington D.C.; Muriel Rukeyser, Savage Coast, Box 1, Folder 32, Muriel Rukeyser Papers 1844–1986, Library of Congress Archives, Washington D.C.
 See my “Introduction” to Rukeyser’s Savage Coast, ed. Rowena Kennedy-Epstein (New York: The Feminist Press, 2013), vii–xxxvii, and my essay, “‘Her symbol was civil war’: Recovering Muriel Rukeyser’s Lost Spanish Civil War Novel,” Modern Fiction Studies 59, no. 2 (2013): 416–39. Also, see Kate Daniel, “Muriel Rukeyser and Her Literary Critics,” in Gendered Modernisms: American Women Poets and Their Readers, ed. Margaret Dickie and Thomas Travisano (Philadelphia: University of Pennsylvania Press, 1996), 247–63. Louise Bogan, “Verse,” New Yorker 27, no. 38 (1951): 150–51, 150. W. H. Auden, foreword to Adrienne Rich, A Change of World (New Haven, CT: Yale University Press, 1951), 2. Louise Bogan. A Poet's Alphabet: Reflection on the Literary Art and Vocation (New York: McGraw-Hill, 1970), 12. Muriel Rukeyser, The Life of Poetry (Ashfield, MA: Paris Press, 1996). Eric Keenaghan, “The Life of Politics: How Muriel Rukeyser (Re)Composed The Life of Poetry in an Evolving “Power-Culture,” MLA Special Session Roundtable, “Re/Considering Muriel Rukeyser’s The Life of Poetry,” Modern Language Association, Austin, TX, January 7, 2016. The CIA would begin to fund the Partisan Review through the CCF in the 1950s. “The Grandeur and Misery of a Poster Girl,” Partisan Review 10, no. 5 (1943): 471–73, 471. See David Bergman, “Ajanta and the Rukeyser Imbroglio,” American Literary History 22, no. 3 (2010): 553–83; Kate Daniels, “Muriel Rukeyser and Her Critics”; Louise Kertesz, The Poetic Vision of Muriel Rukeyser (Baton Rouge: LSU Press, 1980); and Filreis, Counter-Revolution of the Word.